The testing team at Pennsylvania’s Eshleman’s Mill bridge, from left, Justin Dahlberg, bridge engineer; Travis Hosteng, NCWTS director; and Doug Rammer and Jim Wacker, Forest Products Laboratory. The United States has more than 800 historic covered timber bridges, which come in many styles and lengths. The ones still open to vehicular traffic, however, share the need to be load rated to determine how much weight each can safely carry, just like steel and concrete bridges. Because many of these structures were built in the 19th century, the picturesque bridges’s load limits tend to be lower due to age, deterioration, lack of proper maintenance, and other factors. Hosteng is learning that some of the covered bridges have reserve capacity to carry more weight than previously believed. An engineer at ISU’s Bridge Engineering Center, he is developing improved rating procedures for other engineers to determine safe and reliable load ratings for their local covered bridges, many of which are on the National Register of Historic Places. Covered bridges are iconic symbols of rural American history, but they were built with function in mind. The sidewalls and roofs have prolonged the lives of the timber bridges that otherwise would have prematurely deteriorated from the elements. The bridges also provided cover for pedestrians and helped keep skittish horses from getting spooked when crossing water. The U.S. currently has 816 covered truss bridges, Bill Caswell, president of the National Society for the Preservation of Covered Bridges, says. (The truss is the superstructure above the bridge deck that helps support the bridge.) Caswell has documented on his Covered Spans websitenearly 12,000 covered bridges that once existed in the United States. Historic covered bridges can be found in more than half of U.S. states including Iowa. Hosteng’s research began in 2010 and will include 21 to 23 covered bridges in Pennsylvania, Indiana, and Vermont upon completion in 2017. Bridges in the study must be open to traffic and devoid of any steel retrofitted for added support. The project is funded by the Federal Highway Administration’s National Historic Covered Bridge Preservation Program and the U.S. Forest Service’s Forest Products Laboratory of Madison, Wisconsin. No established testing or rating procedure for covered bridges exists, but plans call for Hosteng’s research to be turned into an easy-to-use engineer’s guide for live load testing and load rating for the historic timber structures. “We believe through our testing we can provide a more reliable means for effectively load rating historic covered timber bridges,” Hosteng says. Current ratings are based on empirical calculations, engineering principles, and local codes, but often result in more conservative ratings than those calculated based on field performance data and calibrated analytical models. 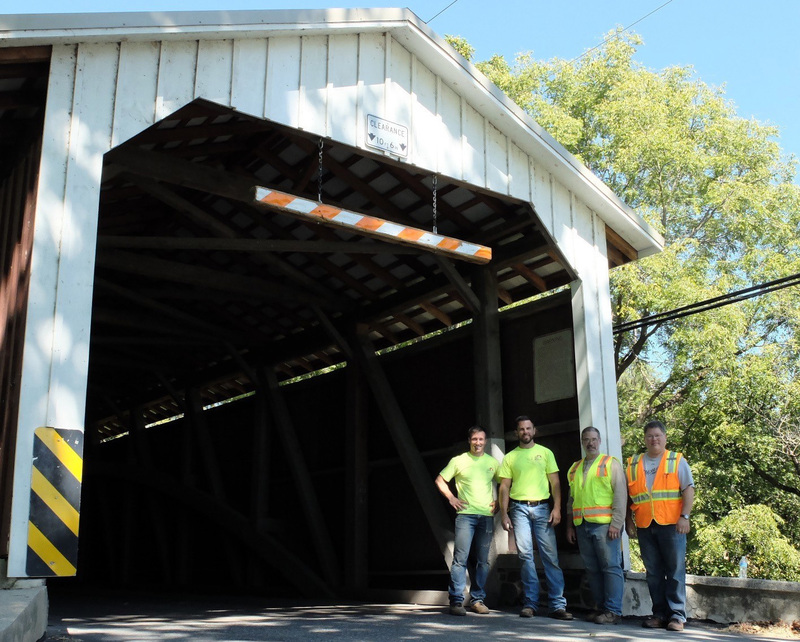 In Pennsylvania, the state with the most remaining United States covered bridges, Hosteng and Forest Products Laboratory staff tested four Lancaster County covered bridges in September. The researchers conducted live load tests using sensors attached to the bridges. A live load is a variableweight on a structure, such as moving vehicles or people. As a loadtruck was driven across the bridge, the sensors collected strain and deflection (vertical displacement) data that were recorded wirelessly on a laptop. The research team also inspected each structure using traditional and nondestructive evaluation techniques to detect the presence and amount of internal decay in the wood. All the data will be used to calibrate two-dimensional computer models that will be relatively quick and easy to use by engineers. The information will be published and made available at the conclusion of the project. Hosteng also has done several projects to help Iowa’s covered bridges. After three bridges were set afire in 2002 and 2003, he outfitted the five Madison County bridges with security devices. The manual developed from that research is available on the NCWTS website, along with additional covered bridge research and information. Covered bridges may be a reminder of past generations, but timber remains a valuable structural material for modern highway bridges. Hosteng says more than 25 percent of the nation’s bridges use wood and “it is an opportunity to efficiently utilize naturally sustainable forest resources.” The National Center for Wood Transportation Structures emphasizes the improved use, durability, and performance of wood transportation bridges and other structures on primary and secondary roads and the rural transportation infrastructure. The ISU Institute for Transportation(InTrans) administers the National Center for Wood Transportation Structures and the Bridge Engineering Center in addition to 13 other transportation centers and programs.